This is my brother Nick and his son Judah. 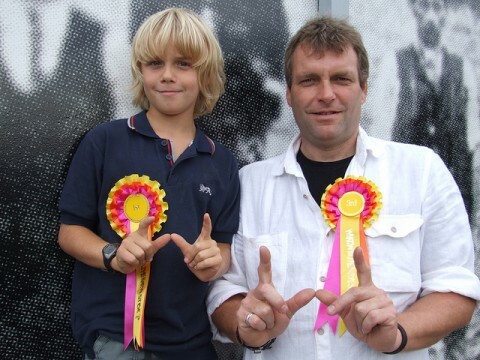 Now, this is a man who prior to recent years was rarely seen to eat a vegetable let alone grow or cook one - and yesterday he took third prize in the cake competition made with his own home-grown carrots! I sadly walked away from the flower arranging empty handed despite (IMHO) a very nice (home grown) Dahlia number ... I was beaten by Judah - my own Nephew ... I had no sway on the judges despite taking notes for them. 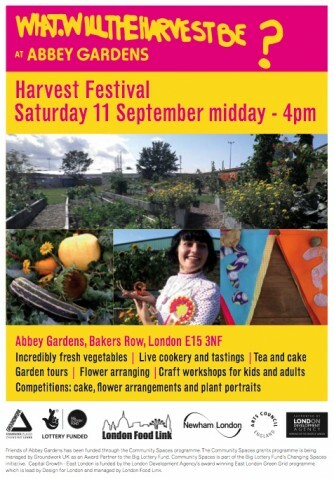 Massive congratulation to all the Friends of Abbey Gardens for a fantastic event on Saturday for the Harvest Festival. 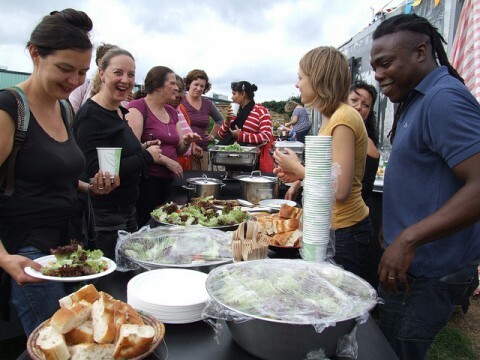 We had about 110 visitors I think, a busy cake stall, lots of produce and seeds 'sold' from the honesty stall, live music and some seriously good food - all straight from the garden and cooked by FOAG member Gary with his partner Elizabetta joining forces with George and Jason as chef's assistants. 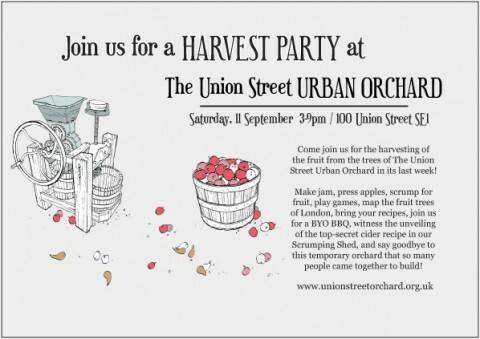 Obviously if you're reading our blog and you're free on Saturday you are most likely to be coming to our Harvest Festival (!) 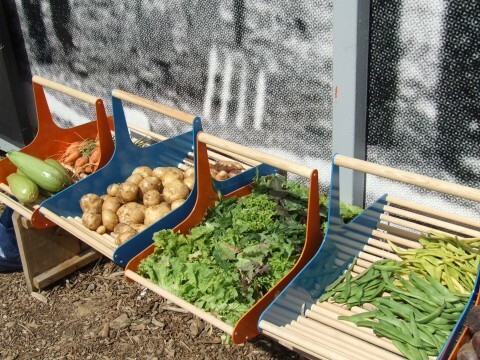 but for any of you who are super keen to visit gardens in the capital, tomorrow is the last chance to see the temporary garden the Union Street Urban Orchard near London Bridge. Their approach is very different to our own 'slow gardening' ethos but the two sites would make a very interesting double day out. Rather conveniently their event begins just about at the end of ours! We harvested a lot of the produce for the Harvest Festival yesterday evening - here's Gary about to take it all away to prepare - no mean feat! 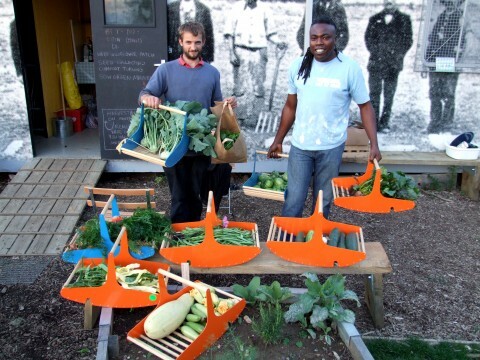 A word of support for our pals at NVA who are holding 'Glasgow Harvest' on August 28th at the Hidden Gardens at Tramway in Glasgow, part of SAGE (Sow and Grow Everywhere) which are cunning portable growbags distributed throughout Glasgow and the Clyde Valley. Keen to dismiss the myth that chips are the only vegetable popular in the city, the event isn't at all po-faced- there is even a luscious sounding 'Jam Wall' planned! 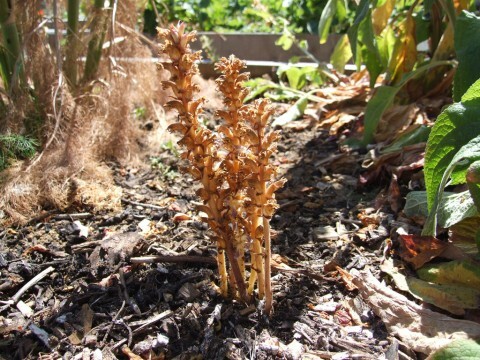 Hamish was excited to find this unexpected visitor in our raised beds ... it's a parasitic plant apparently, we think just the 'common' Broomrape but we're not 100% sure. Any experts out there chip in!